The Town of Newburgh NY is a suburban community of approximately 30,000 residents in Orange County, New York. Nicknamed “The Crossroads of the Northeast”, the Town of Newburgh is a prime choice for commuters to New York City and the surrounding areas. Individuals, families and seniors alike choose to make their homes in Newburgh for its many amenities and the picturesque beauty of the Hudson Valley region. Investing in real estate in Newburgh has become more popular this year with home sales increasing almost 30% over last. 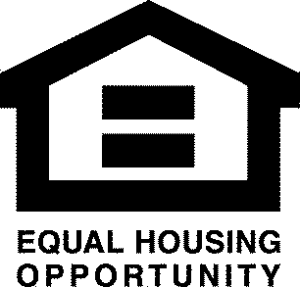 Owning a home in the Town of Newburgh is both affordable, in a great location. Our availability of homes for sale range from historic to contemporary, modest to grand, offering townhouses and single family homes to those that live in our borders. Neighborhoods range in price and style along with a budget to suit just about anyone. New construction homes are becoming more popular as value is ever increasing and remaining affordable. Newburgh is an area of land that sits perched on the western shore of the Hudson River overlooking the picturesque Hudson Valley. We are comprised of a “town” and a “city,” which gives homebuyers the best of both worlds with an urban and rural feel. Many people are unaware of our unique landscape: two distinct municipalities, the Town and City of Newburgh that share some of the best waterfront real estate in the Hudson Valley. Over two miles of shoreline, our panoramic Hudson River views allow us some pretty great bragging rights. Our home and land is an area rich in American History set with a majestic backdrop of mountains and the Hudson River. The Town of Newburgh is located approximately 60 miles north of New York City and 90 miles south of Albany. It is bordered to the east by the Hudson River, providing many homeowners with sweeping views of the valley. To the north, it is bordered by the towns of Plattekill and Marlborough, and to the west by Shawangunk and Montgomery. The town of New Windsor and the City of Newburgh sit on the southern border of the town. Collectively, the Town and the City of Newburgh are often referred to simply as “Newburgh,” but in reality the two have been separate and independent municipalities since 1865. Compared with the City, whose population of 29,000 occupies a densely populated 3.8 square miles, the suburban Town of Newburgh covers approximately 47 square miles with a slightly greater number of residents. Located at the junction of Interstate 84 and New York State Throughway I-87, Newburgh boasts excellent commuter access. New York State Highways 9W, 17K, 32, 52, 300 and 207 also cross through the town. Directly across the river, the town of Beacon is home to a nearby Metro North railway station, an excellent and stress-free choice for many Newburgh-to-NYC commuters. Access to the station is easy via the Newburgh-Beacon Bridge or via ferry from the neighboring City of Newburgh. The land that was to become the Town of Newburgh was originally the home to the Lenape tribe of the Algonquin nation. European settlers first came to the area in the 18th century, and the Precinct of Newburgh was established in 1763, making Newburgh one of the oldest communities New York State. It was reorganized as the Town of Newburgh in 1788, and separated from the neighboring City of Newburgh in 1865, creating the 45 square mile area that remains the boundaries of the Town to this day. Historically, the Town of Newburgh was known as a sparsely-populated farming and manufacturing community, which provided needed supplies to the neighboring city. The presence of several creeks made the town an ideal location for the milling of paper, grist, and wool, as well as a black powder manufacturing plant. Enthusiasts can take in a bit of local history at the Gomez Mill House, the only remaining intact mill and a registered historic site as the oldest Jewish dwelling in North America. The Balmville Tree is another historical landmark well-known to local residents. With scientists estimating that it dates back to 1699, the tree has stood strong since before the arrival of European settlers, through the Revolutionary and Civil Wars, and into the present day. Local lore suggests that George Washington once enjoyed its shade, and Franklin Roosevelt was known to visit it frequently. 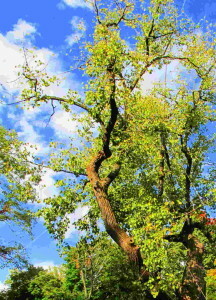 Although it is not in fact a Balm of Gilead tree, as it was originally misidentified, but an eastern cottonwood, the misnomer stuck and the tree lent its name to the small hamlet of Balmville within the town’s borders. Today the tree receives federal and state protection, with the 348 square feet surrounding it designated as New York’s smallest state forest. 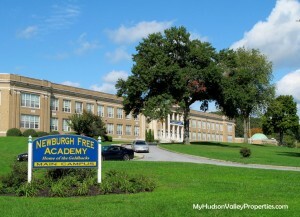 The Town of Newburgh is primarily served the Newburgh Enlarged City School District, whose nearly 12,000 students also reside in the neighboring City of Newburgh, Town of New Windsor, and a small section of Cornwall. NECSD includes nine elementary schools, two middle schools, and one high school. Each of the elementary schools has a program theme; for example, Balmville focuses on communications and media, while GAMS Tech gives students an opportunity to focus on science and technology. The elementary schools are magnet, meaning that students are given an equal opportunity to enroll in their school of choice, regardless of geographic location. Small portions of the Town of Newburgh are also served by the Wallkill, Marlboro, and Valley Central School Districts. Always be sure to verify your district by calling the district office before moving forward with a new home. It is impossible to mention life in the Town of Newburgh without remarking on it’s excellent location and options for commuters – and not just to New York City. Newburgh is an accessible 30 minute drive from the nearby cities of Middletown and Poughkeepsie, and with its easy highway access, commuters can find a direct route to just about anywhere in the area. However, life in Newburgh is more than just convenient. It is an affordable and beautiful area to build your dream home, with space for a lush green backyard or a swimming pool for hot summer days. With the Town of Newburgh growing every day, you will also enjoy the expanding selection of local and national businesses and restaurants to serve all your needs. Don’t forget the close proximity to all the amenities of the City of Newburgh as well! Outdoor enthusiasts, sports lovers, and active families in Newburgh enjoy spending their days at Cronomer Hill Park, with its hiking trails, playground, ball fields, lighted tennis courts, and picnic area. From atop the 30 foot tall observation tower, awe-inspiring views of the Hudson River Valley delight visitors, who can see as far as New Jersey from the hill’s peak. Chadwick Lake Park is a favorite spot for fishing and boating. Visitors can also stop by year-round to take the dog for a run, or enjoy a game of roller hockey or bocce ball. Whether you are a commuter looking for an affordable place to settle down, or a family looking to move into the house of your dreams, you’ll find that Town of Newburgh is a wonderful place to come home to. With a variety of diverse options for condos, townhouses, and single-family residences, you are sure to find a home that is a perfect fit. More affordable housing and an ever-growing, diverse population, Newburgh communities and neighborhoods are expanding to accommodate more newcomers each and every day. Many are relocating from New York City and beyond.